The DCR-2500 is a receiver compatible with the Dakota Alert 2500 series of products. The receiver plugs into a standard wall outlet and will play one of four tones when triggered by a compatible transmitter/sensor. The receiver plays at approximately 85 dB and has a volume control knob that allows you turn the volume all the way down or all the way up. The receiver gets a wireless signal from a compatible receiver such as the driveway alert sensor, a outdoor rated motion-based sensor, a door/window magnetic contact, or a push button. Simply match the dip switches on the transmitter/sensor to the dip switches on the receiver’s zone, and each triggered sensor will make the receiver play a distinct sound (scroll below to hear available sounds). Let’s say you have a large warehouse with two entry doors, and you would like to place a wireless push button outside the door. For the first push button, the UT-2500, on your exterior door you can associate it with Zone 1 on the receiver, and when triggered it will play the “Classical” sound. For a second door you can place another push button outside and associate it with zone 2 and it will play the “Westminster” melody. You can use this receiver to expand your existing system. 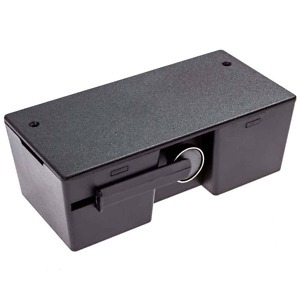 For example, if you are using the WDK-2500-STROBE Warehouse Doorbell Kit and need to put a receiver in more than one location, the DCR-2500 is the desktop version of the receiver you would purchase. If you have an existing system and need to replace a receiver, this is a replacement part. The receiver must be paired with a compatible transmitter. Receiver has four zones. Transmitters/sensors are paired into a respective zone. Sound level is approximately 85 dB. unit works as expected...better than expected in fact! Great product. I have three units (different residences in one grouping) with three transmitters ,transmitting to each receiver. Best price and extremely fast service. I highly (and frequently) recommend Dakota Alert and 1800 Doorbell. Our office is 13,000 Sq. Our office is 13,000 Sq. ft. and the 4 receivers are working perfectly!